While our handcrafted barn doors are functional, they are also art. The wood we source is from buildings and barns can be up to 300 years olde. Each door is a uniquely designed and crafted and some of our customers commission us to create a door just to hang on their wall. Like a piece of art. John from Topsfield, Massachusetts wanted a large, live-edge rustic hanging barn door to serve as art for his stylish open space living room. This 8-foot wide door was made from 300-year-olde pine from Maine and the wheel hangers are giant period pieces that work perfectly for this space. While the large door is not meant to glide side to side, John's large clock hanging on the door moves us through history minute by minute. John in Danvers, Massachusetts wanted an eclectic, rustic barn door to hang in the family's rec room as a piece of art, and not necessarily to function as a sliding door. It hangs over part of an unused door in the space and now gives the room that extra pizazz that it deserves. 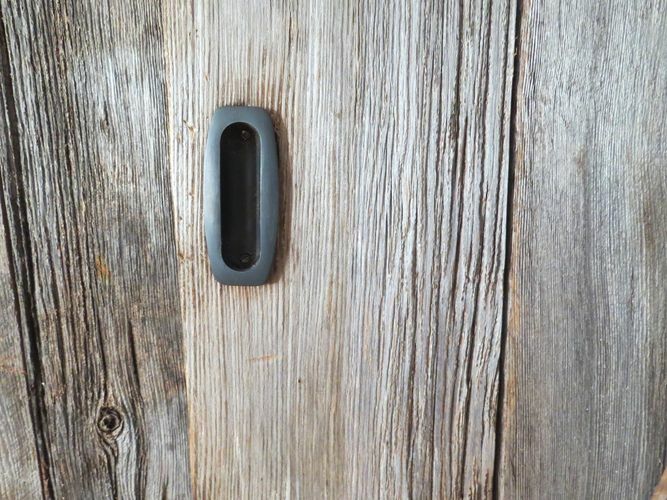 The door uses period wheels, an olde track and brown pine from a 150-year-olde New Hampshire barn instead of any of today's hardware. A subtle "T" is made on the lower half of the door to relect the family name.